Hydrangea flowers are produced from early spring to late autumn; they grow in flowerheads (corymbs or panicles) at the ends of the stems. In many species, the flowerheads contain two types of flowers, small fertile flowers in the middle of the flowerhead, and large, sterile bract-like flowers in a ring around the edge of each flowerhead. Other species have all the flowers sterile and of the same size. In most species the flowers are white, but in some species (notably H. macrophylla), can be blue, red, pink, light purple, or dark purple. In these species the exact colour often mirrors the pH of the soil; acidic soils produce blue flowers, neutral soils produce very pale cream petals, and alkaline soils results in pink or purple. This is caused by a color change of the flower pigments in the presence of aluminium ions which can be taken up into hyperaccumulating plants. Happy 1st Blue Monday, Cher! Check out my book giveaway. this is an awesome center piece. love it. Hydrangeas are one of my favorite flowers! It's beautful. That is absolutely one of the most beautiful hydrangeas I have seen. You did a marvelous job on Blue Monday. I enjoyed visiting your blog. The hydrangeas are beautiful, I love that shade of blue. 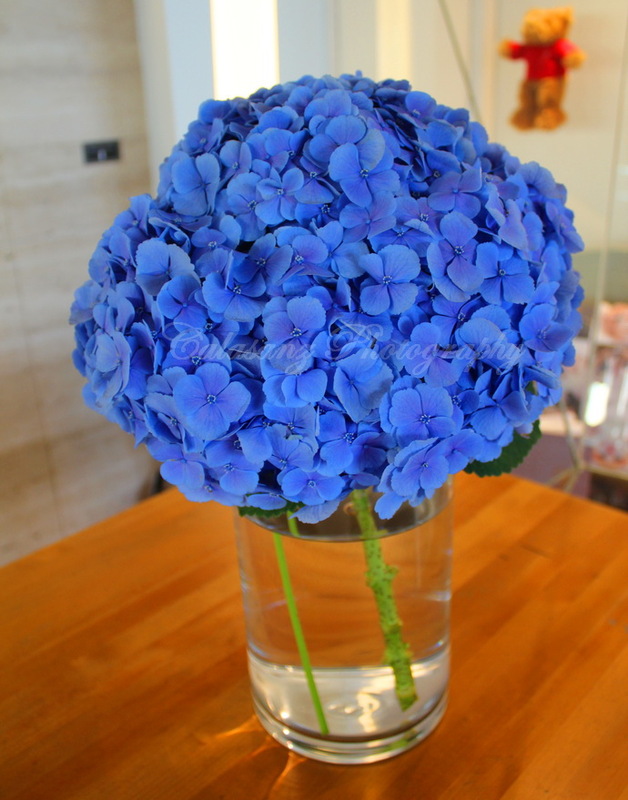 I love hydrangeas, especially blue ones. Happy Sunday. It would be a delight to have you come and visit my flower post for today. Thanks! Your lovely photo brings back memories of the amazing blue hydrangea bushes in our front yard when we lived in Atlanta, GA (USA). Here in north Florida, they do not grow as well, so we are enjoying all the plants (many of them new to us) that thrive in this climate. Thanks for all your delightful entries--especially liked seeing your daughter as she awaits the new birth in your family. Many blessings to all of you! what a relief to see such a blue-tiful bloom. how are you doing Sistah? How's our little one inside doing? Kicking hard and strong I hope. Hugs to big sister Kyla. take care of yourself. I love the beautiful colour of this flowers! Blue flowers are always special and yours is no exception. Love the landscape in your header. Such a vivid blue! I love the lace cut ones.